Through its history, Newfoundland and Labrador has produced generations of seafarers and ocean innovators. Surrounded by the cold, harsh, ice-prone waters of the North Atlantic, at the edge of the Arctic, the people of Canada’s most easterly province have had to embrace the sea and answer its challenges to thrive and make livings. Today, technology ensures that training seafarers and prototyping new technologies does not have to mean risking life and limb, or unnecessary expense. Newfoundland and Labrador houses some of the most advanced simulators in North America. Central to this is the Center for Marine Simulation (CMS) housed at Memorial University’s (MUN’s) Fisheries and Marine Institute (MI). The CMS is home to a suite of 16 marine simulators, with a 17th soon to be added in the form of an Offshore Anchor Handler Simulator. MI’s best-known simulator is the Full Mission Ship’s Bridge Simulator. Mounted on a hydraulic base in a surround theatre, it is one of only two full-motion ship’s bridge simulators in the world, capable of accurately simulating any ship and sea state. CMS is also home to a Ballast Control and Cargo Handling Simulator; three Dynamic Positioning Simulators; a Navigation and Blind Pilotage Simulator; aPropulsion Simulator; and aTug Simulator. MI is using its simulation capacity to nurture the next wave of ocean experts through its School of Maritime Studies and its School of Ocean Technology. Further to the in-house capabilities of CMS are private companies specializing in the fields of lifeboat and ROV (Remote Operated Vehicle) simulation. Virtual Marine Technology (VMT), incorporated in 2004, has created simulation systems which allow lifeboat operators to practice lifeboat launch, operation and recovery drills using equipment specific to the type of lifeboat on board their platform, drilling rig or vessel. The cabin-based systems, not unlike flight simulators, allows lifeboat coxswains to train effectively in real emergency situations and with major hazards such as fire and explosions, in a safe, virtual environment. So realistic are the simulators that it is not uncommon for operators to become seasick, or to work up a sweat during the simulation exercises. All the better, say VMT’s technicians, for ensuring that lifeboat coxswains will be adequately prepared for a real-life emergency. “It’s really about competency development,” says Whiffen. “Enhancing the competency of the guys that operate these boats.” Boats that, unlike the larger craft simulated at CMS, which will ideally see real-world operation in an emergency situation. 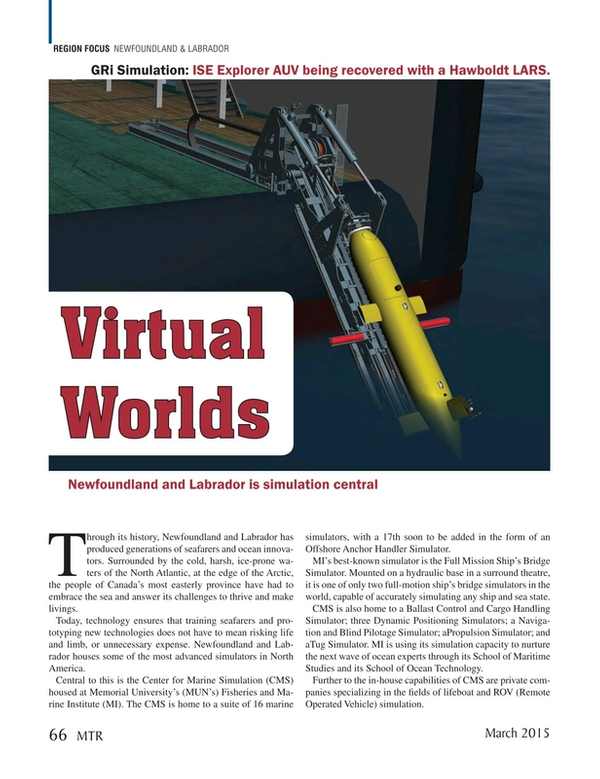 VMT maintains a close affiliation with Memorial University, its simulators being used in the Marine Institute’s training programs, and to perform human factor studies that guide the continued development of the simulators. VMT has also established solid working relationships with the biggest lifeboat manufacturers in the world. Another simulation capacity is that of subsea ROV (Remote Operated Vehicle) and AUV (Autonomous Underwater Vehicle) simulation, thanks to GRi Simulations Inc.
GRi began to focus on simulation technologies in 1999. Answering a training requirement for ROV operators, the company took a new approach of utilizing networked PCs rather than the approach of large workstations that had been the previous focus of industry. From there, the innovations continued, GRi creating a level of detail in its simulations that eclipsed the competition. For instance, GRi found a way to accurately simulate the tethers that connect ROVs to surface ships, preventing what Stephen Dodd, VP Operations, describes as potential “negative learning”, whereby ROV pilots trained using inferior simulators might run into potentially very costly difficulties should the tether becomes caught or tangled. It is a level of detail that has become the hallmark of GRi’s simulation technology, which can accurately replicate large subsea structures, complex mechanical systems and harsh environments in high detail. The cameras and sonars used aboard the ROVs that become the pilots’ eyes to the underwater world are themselves precisely simulated, while trainee pilots can also be exposed to extreme sea conditions, without any risk to the expensive real-world equipment. In addition to training, GRi’s technology is used for product prototyping that can save AUV/ROV technology manufacturers substantial time and money. So accurate is GRi’s virtual ocean environment and dynamic performance that new technology designs can be tested at variable depths, current conditions, extreme conditions, and carrying out a range of activities, without the need to put an underwater vehicle overboard or even build it in the first place. GRi also maintains a close cooperative relationship with the Marine Institute; its simulators being used as part of MI’s pilot training programs. This is a critical component in training pilots who need to have a firm grasp of the intricate controls and a ‘feel’ for operating a robot under water. GRi simulators are also utilized in the training operations of a number of private companies and public institutions, including for example Alpena Community College in Michigan and the Underwater Training in Brazil.